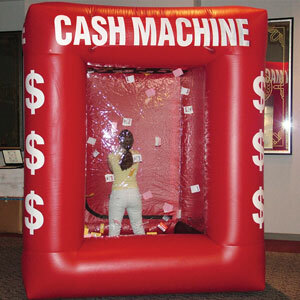 You and your classmates each get a set, customizable amount of time in a giant inflatable air-powered cash cube for a chance to win cash and prizes. This interactive crowd-pleaser functions as a game show that will both entertain a large group and allow each guest to become part of the fun. At the end of each hour a prize is awarded to the highest score in the CAMPUS CASH CUBE. You can fill the cube with funny money, real cash, coupons, certificates, or tickets that can be traded for prizes. Use your imagination to incorporate this program into the theme of your event. One volunteer to help count winnings and facilitate, water or access to beverages, and access to a power outlet. If nearby parking can be arranged that would be appreciated as well. Want to talk with us about Campus Cash Cube?